Jane Battersby wins price for excellent research on food-security. I just learnt that my co-worker and former WOK-UE researcher Dr Jane Battersby just received the 2017 laureate of the Premio Daniel Carasso at a ceremony in Valencia, Spain on 18 May. I have known Jane since 2006 and its a great pleasure to see her success for her fantastic work. Wonderful! 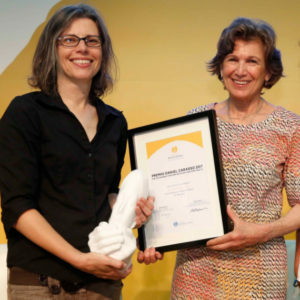 The international prize, first presented in 2012 by the Daniel and Nina Carasso Foundation is awarded every two years in recognition of outstanding scientific research into and social commitment to sustainable food systems and diets for long-term health. Jane was selected as the laureate by a jury of experts from among 40 candidates from 25 countries. Her work on feeding poor populations in urban areas in southern cities undergoing rapid growth is extremely relevant. Strong urban growth will be a major issue in the next few decades. On the global level, our ability to feed urban populations could either be a vector for stability or a destabilising force. Jane Battersby tackles these fundamental questions from the perspectives of social justice, governance, education, fairness and gender equality. I first met Jane back in 2006 when I was invited with Thomas Elmqvist by Sue Parnell and Jane to visit the University of Cape Town. Brought together by the senior scholars Sue and Thomas, we had developed initial ideas on developing a collaborative exchange programme between Stokholm University and UCT around urban ecology and socio-environmental urban studies. I now realise that this is quite a long time ago—even before ACC existed as it started in mid-2007. Jane and I ended up co-writing the grant proposal to NRF and VR, which are the South African and Swedish research councils. It was a so-called “Swedish Links” project, which should really be called “South African and Swedish Links” since NRF paid half of the funds. And we ended up being successful. This in turn put us on the track to have colleagues travel back and forth between Stckholm and Cape Town, but crucially also to eventually fund the very successful Ways of Knowing Urban Ecologies Project by Swedish Formas with empirical studies starting in Cape Town in 2011 (see my final report and short reflection on this project here). If I understand Jane’s trajectory correct, it was through her empirical work in the WOK-UE project that she first started to do work on cities and food. She had already done studies on race and identities in South African cities and her work with urban environmental issues in WOK-UE seems to have laid the ground for her later and extremely successful food-security work. Her work in WOK-UE focused on the sociospatial relations and conflicts around Cape Town’s Phillippi Horticulture Area (PHA; longer AFSUN/WOK-UE report here). Since the late 1800s it has hosted smaller- to larger-scale farms that have produced vegetables for the city. On one hand, she studied how the PHA is “seen” within town planning practice and the apparent difficulties to use current town planning tools to secure food producing spaces in Cape Town, which is under immense pressures for housing development. With our WOK-UE assistant Jessica Rattle, they dug up tons of maps and new and old policy documents. Secondly, she followed an emergent local farming and food-security movement that was fighting against the pressures to build large-scale housing projects on PHA and at one point this movement was interlinked with the mobilisations around the Princess Vlei wetland that I was studying. As it happens, the PHA became a fascinating study that brought together several contested urban environmental issues, which revolved around land, housing, planning, and racial and class-tensions. With her solid training in human geography, I learnt a lot from her critical theoretical engagement with the politics of urban environments. Her later work on food-security in cities of Southern African cities has later been carried out within other projects and with other co-workers, not least ACC’s Dr. Gareth Haysom who has been a crucial partner to her. This work, which has been ruthlessly empirical and included surveys and on-the-ground work in some 8 Southern African cities including Cape Town, I would like to mention what I find to be one of her main contributions, and which I have often passed on to students and Northern colleagues in particular, which is her crucial critique of the Northern and EuroAmerican bias in current “urban farming” discourse as she cautions us to reflect on how concepts, planning practices and social movement ideas travel into Southern urban contexts. These cities are very different, inscribed in particular ways in wider capital, state and socioenvironmental relations, and if people are to be fed, and longer-term movements to be formed that can make a difference, then the wider “food system” needs to be placed in view. While the general response has been to increase production either through highly industrialised systems, through nutrition supplementation, or by placing the burden on the poor to produce their own food (as in community and shack gardening etc.) that all run the problem of depoliticising food’s inherent class, gender and racial structures, the challenge lies instead in engaging the “food system” as part of a far broader social, economic, environmental nexus. Jane’s work with co-workers helps us to see this wider system and to find concrete points of interventions toward social and environmental justice. Apart from her theoretical interventions, she also has an enviable knack to hard-wire her critical empirical work to policy discussions, having both politicians and activists listening to the work she is doing. She is a very valuable scholar at ACC and to all those she works with. Its a pleasure to have known Jane during these years and see her success today. Congrats to you Jane!